Germany is well known for its abundance of fairytale castles. These magnificent constructions have inspired filmmakers and storytellers for generations. However, there’s one German palace that might just compete for the title of most impressive castle of all. 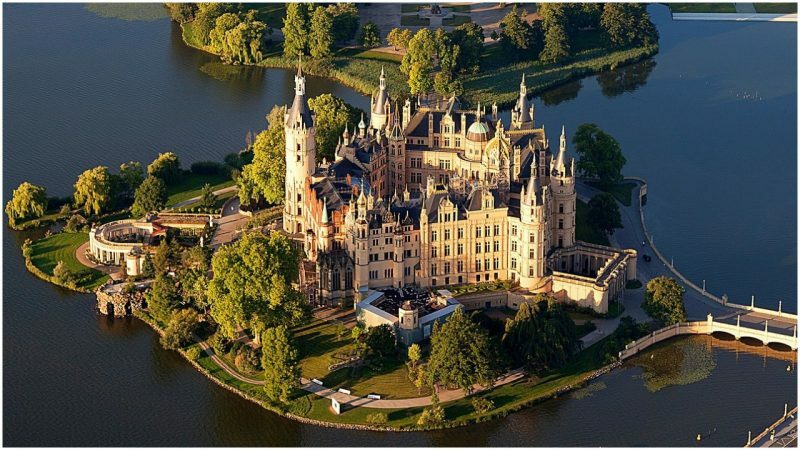 Schwerin Castle is an architectural masterpiece, consisting of 653 rooms and dozens of pointed towers. It sits on an island in the middle of Lake Schwerin, boasting fabulous views across the water. Soon to become a UNESCO World Heritage Site, it was even used as a location for the 2017 movie blockbuster Kingsman: The Golden Circle. Schwerin Castle, Mecklenburg-Vorpommern state, northern Germany. There has been a fort sitting on this island for over 1,000 years, although according to the Schwerin Castle website, the first major fortified structure was constructed in 1160 by Germanic noblemen who ousted the incumbent Slavic tribe, the Obotrites. The Counts of Schwerin created an important medieval dynasty, merging with the Dukes of Mecklenburg in the 14th century. Although there is little left of the 13th and 14th century structures, the castle’s medieval past played a critical role in shaping its future. 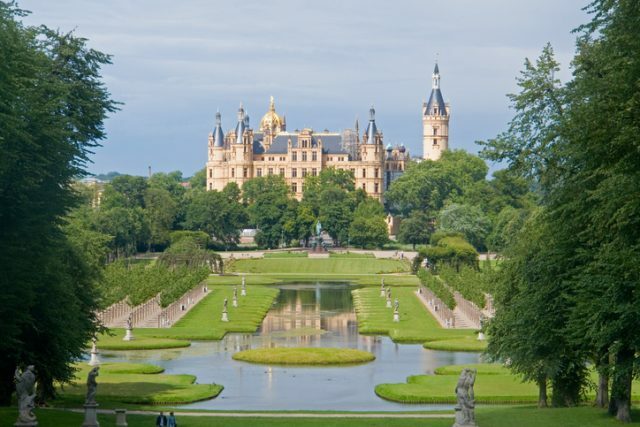 In the 19th century, the Dukes of Mecklenburg-Schwerin decided to move their ducal residence back to the lake, and sought to renovate the castle, which had fallen into a poor state. As the Schwerin Castle website reports, the 1840s were a difficult time for the German aristocracy. They had been weakened by the impact of the war with Napoleon, as well as the social and economic changes that were sweeping through Prussia in this period. The Grand Dukes wanted to make a bold statement, affirming the power and nobility of their line and justifying their rule. What better way to achieve this than by reminding the people of their family’s glorious medieval past? 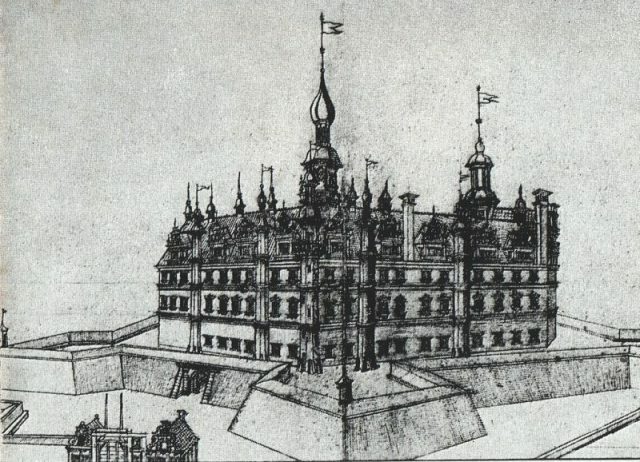 The fortified castle and its bastions, 1617. 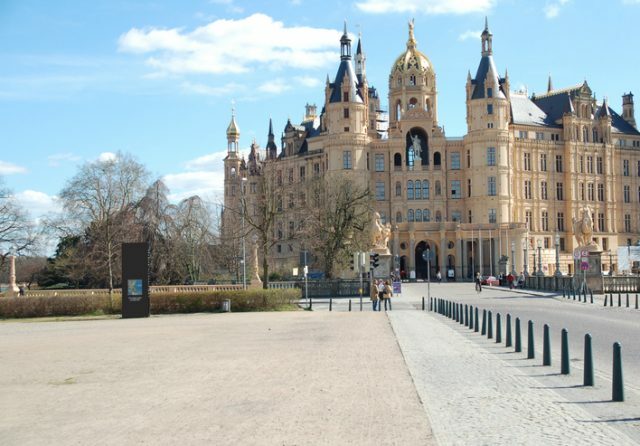 In 1847, the Grand Duke Friedrich Franz II ordered the complete rebuilding of the ducal seat at Schwerin Castle. He profoundly disliked the jumbled mixture of architectural styles of the different buildings that had accumulated over the years, and wanted to begin again with a clean slate. This would not only be a restoration of his ancient family home, it would be the remaking of a dynasty. 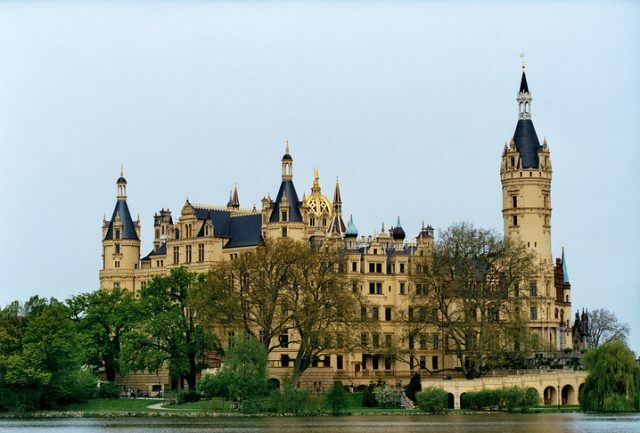 The wonderful castle in Schwerin, capital city of Mecklenburg-Vorpommern. To realize his vision, the Grand Duke needed pioneering minds. As a result, he approached some of Prussia’s finest visionary architects and commissioned them to design the ultimate fairytale castle. The team included Georg Adolf Demmler, Gottfried Semper and Friedrich August Stüler, all of whom were renowned architects of their time. With Demmler in charge of the project, the Grand Duke was convinced that he was on track to create a masterpiece. Schwerin Castle, located on an island in the lake of the same name, Schweriner See. It was for centuries the residence of the Dukes of Mecklenburg and today is the seat of the Landtag. The Grand Duke’s vision demanded something pioneering and modern, yet it also needed to be suffused with reminders of the great medieval past associated with the castle and the ducal family. Demmler’s style tended toward the Neoclassical models that were popular in Europe at this time, but the Grand Duke was adamant that he would have something more distinctive and unusual. Schwerin Castle, Schwerin, Mecklenburg-Vorpommern, Germany. In order to gather inspiration, the Grand Duke sent Demmler on holiday. According to the Schwerin Castle website, this great architect toured around France, visiting castles all over the country, furiously sketching his ideas. Finally, on the banks of the River Loire, he came to the Chateau of Chambord. Here was the inspiration he had been searching for. Demler’s design was heavily influenced by what he seen in France, and incorporated many Renaissance-style features. 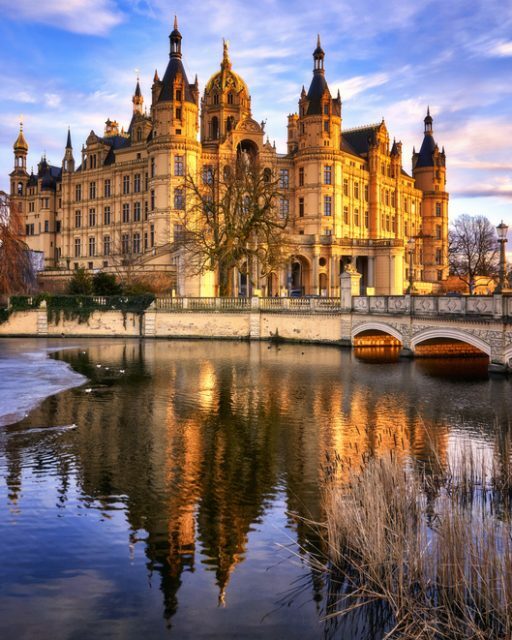 This modern take on the late medieval past is known as Neo-Renaissance architecture, and Schwerin Castle is one of its finest examples. Soon after construction was completed in 1857, the castle became known as a masterpiece. The Grand Duke had succeeded in creating a unique legacy, a grand statement about his family’s glorious past. Today, although the Grand Dukes themselves have faded into history, Schwerin Castle remains. This beautiful monument is a testimony to Germany’s rich and fascinating past.